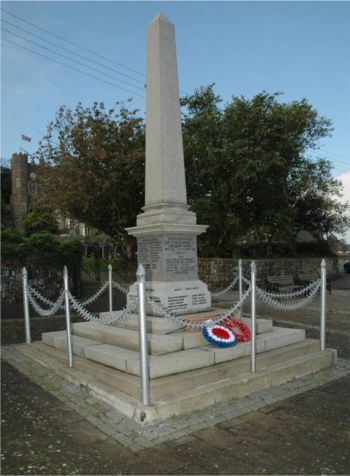 Situated in a prominent position overlooking the Quay, the plinth was used for the 1939 - 1945 names on the War Memorial. The different services are grouped separately (as was done for WW1) .As could be expected, the majority of men from this village who died lost their lives at sea, either in the Royal Navy or serving with the Merchant Navy. The names of two men were omitted from this memorial but they are buried in the adjacent churchyard. C/LD/X 3604 Able Seaman Harry Herbert Johnston of the Royal Naval Volunteer Reserve, HMS Registan. Died 27 May 1941. Buried in Appledore Churchyard. HMS Registan was bombed, caught fire and eventually sunk by enemy action off Cape Cornwall. There are five graves in Falmouth cemetery containing the remains of 27 unidentified crew members. Over 180 perished in the incident but 34 men, including the Master, were picked by the Argentinian merchant Rio Neuquen and landed at Pernambuco on 11 October. D/MX 84749 Sick Berth Attendant Norman H. Simpson of the Royal Navy, HM Motor launch 524. Son of William and Lily Simpson. Born in Taunton in the March Quarter of 1923. Died 31 December 1942 aged 20. Sole Casualty. Records show that he died of drowning - cause not known. Buried in Appledore Churchyard. 1571123 Private Ronald Crowston of the 6th Battalion, the |Gordon Highlanders. Son of Clara Crowston and the late Tom Crowston; husband of Dorothy Elizabeth Crowston of Appledore. Born in Grimsby in the June Quarter of 1916. Died 26 September 1944 aged 28. 5624786 Troopoer Douglas gerald Clements of "B" Squadron, the 56th Reconnaissance Corps. Son of Alfred and Teresa Maud Clements ; husband of Adelaide Clemetns of Appledore. Born in Appledore in the December Quarter of 1919. Died 22 November 1942 aged 23. 14523180 Gunner Albert Edward Heard of 532 Coast regiment, the Royal Artillery. Son the late William and Mary Jane Heard of Appledore; husband of N.E. (M.E?) Heard of Appledore. Born in Appledore in the December Quarter of 1893. Died 21 June 1944 aged 51. Buried in the Appledore Churchyard. 952885 Private Joseph Thomas Needs of the 2nd Battalion, the King's Shropshire Light infantry. Husband of Mary Need of Appledore. Born in Appledore in 1916, Died 21 September 1944 aged 28. 5622700 Sapper Leonard Fairfax Ross of 55 Field Company, the Royal Engineers. Son of Fairfax and Alice Ross of Appledore; husband of Elsie Ellen Ross of Appledore. Born in Appledore in the March Quarter of 1919. Died 27 October 1943 aged 23. 2000769 Corporal John W. Taylor of 280 Field Company. ; the Royal Engineers. Son of John William and Sarah Elizabeth Taylor of Appledore; husband of Ethel Doreen Taylor of Appledore. Born in Appledore in the December Quarter of 1918. Died 6 June 1944 (D-Day) aged 26. 14673646 Private (Derek) Anthony Williams of the Infantry division of the Gordon Highlanders. Died 18 June 1944. LT/JX 405153 Ordinary Telegraphist William Ronald Bennett of the Royal Navy, HM Trawler Birdlip. Son of William and Marian Bennett of Appledore. Born in Appledore in the September Quarter of 1924. Died 13 June 1944 aged 19. D/MX 93556 Engine Room Artificer 5th Class (William John) Norman Ford of the Royal Navy, HMS Saumarez. Son of John and Florence Ford of Appledore. Born in Appledore in the March Quarter of 1926. Died 22 October 1946 aged 20. Saumerez hit a mine secretly laid by the Albanians (this was at the beginning of the Cold War). D/ MX 95537 Cook Leslie John Green of the Royal Navy. HMS White Bear (previously a privately-owned vessel converted to become a survey ship). Died 16 December 1942 as the result of a boiler explosion - sole casualty. Buried in Appledore churchyard. D/JX 131900 Petty Officer Ronald Edgar Hammond of the Royal Navy, HMS Kimberley. Son of Arthur and Alice Hammond; husband of Winifred Hammond of Plymouth. Born in 1912. Died 8 May 1942 aged 31. LT/JX 222771 Seaman William John Taylor of the Royal Navy Patrol Service, Drake II. Son of the late Jonathan and Harriet Taylor of Northam; Husband of Annie Taylor of Northam. Born in Appledore in the March Quarter of 1889. Died 8 June 1941 of illness aged 53. Buriied in Appledore churchyard. Lieutenant John Murts, DSC of the Royal Naval Volunteer reserve, HM LCT 494*. Son of William and Louise Murts; husband of Molyneux Oatway Murts. Born in Hammersmith, London in 1919. Died 18 October 1944 aged 25. * Landing Craft Tank. 494 foundered in bad weather off Land's End. Four other Landing Craft Tanks - 488, 7014, 7015 and 7023, foundered in the same storm with considerable loss of life. D/JX 224153 Chief Petty Officer Frederick Slade of the Royal Navy, HMS Forte*. Son of Stephen and Lilian Slade of Appledore; husband of Dora Anne Slade of Appledore. Born in Appledore in 1904. Died 20 November 1842 aged 39. HMS Forte was not a sea-going vessel - it was the Navy's name for the shore base established in FalmouthFrom which coastal defence was controlled. The cause of this man's death is not yet known. D/JX 126429 Petty Officer Leslie Squire of the Royal Navy, HMS Norfolk. Son of Caleb and Emma Squire; husband of Katherine Margaret Squire of Appledore. Born in Appledore in 1910. Died 26 December 1943 aged 33. D/JX 128054 Petty Officer Frederick Albert Vincent of the Royal Navy, HMS Ardent. Son of Lewis and Alice Vincent; husband of Doris Mary Vincent of Appledore. Born in 1911. Died 8 June 1940 aged 29. Several hundred men were killed that day in the loss of three of the Navy's largest ships - HMS Glorious, HMS Acasta and HMS Ardent . Bosun Eric Bennett of the Merchant Navy, SS Firth Fisher (Barrow). Son of Joseph and Elizabeth Bennett; husband of Bessie Irene Bennett of Appledore. Born in Appledore in the September Quarter of 1906. Died 21 May 1940 aged 33. SS Firth Fisher (previously known as SS Freelander) was a British Cargo Steamer who hit a floating mine near Boulogne and sank with the loss of all hands. 188772 Greaser Arthur Brooks of the Naval Auxiliary Personel (Att. merchant navy), HMS Tynwald. Born in 1913. Died 12 November 1940 aged 19. Two torpedos from the Italian submarine "Argo" struck HMS Tynwald which quickly settled in 7 metres of bottom. 10 were killed - the survivors were rescued by HMS Roberts and HMS Samphire. Junior Engineering Officer Leonard Carter of the Merchant Navy, MV Thomas M (London). Son of Frederick and Mabel Carter of Dartford, Kent. Died 24 November 1940 aged 19. Chief Officer Philip Evans of the Merchant Navy, SS Bradfyne (Bideford). Son of William and Mary Ann Evans; husband of Doris May Evans of Walsall, Staffs. Born in 1906. Died 22 November 1940 aged 34. SS Bradfyne which was not sailing in convoy, was torpedoed and sunk by German sub. U100. 38 men were killed. Thomas Screech's career with the Merchant Navy is not known. He was the son of William and Winifred Ann Screech of Appledore and his father was also a seaman. Born in Appledore 22 March 1915. The date of his death is not yet known. Able Seaman Albert Henry Lesslie of the Merchant Navy, SS Strait Fisher (Barrow). Husband of Catherine Lesslie of Appledore. Born in Appledore in the June Quarter of 1886. Died 3 January 1945 aged 58. Able Seaman Thomas Marshall of the Merchant Navy, MV Fife Coast (Liverpool). Son of Alexander and Isabelle Marshall of Appledore. Born in Appledore 30 November 1893. Died 8 August 1940 aged 42. MV Fife Coast was torpedoed 8 August 1940 while part of a 25-ship convoy. Chief officer James Arthur Petley of the Merchant Navy, SS Florian (Liverpool). Son of James and Caroline Petley; husband of Florence Maud Petley of Appledore. Born in Hendon in the March Quarter of 1902. Died 18 January 1941 aged 39. SS Florian was travelling from Hull to New York in ballast when she was sunk by German submarine U94. All 44 crew were lost. Master Edgar Stone of the Merchant Navy, SS Oswestry Grange (London). Son of Crosdaile and Ann Stone; husband of Emily Stone of Appledore. Born in Appledore in the December Quarter of 1888. Died 12 February 1941 aged 52. SS Oswestry Grange was sailing from Rosario in Argentina, to Liverpool when she was torpedoed. 37 survivors were taken to Madeira - 5 people were missing. The vessel was last seen on fire. Apprentice Joseph Lewis Groves of the Merchant Navy, MV Cornish City (Bideford. Son of Alfred and Gertrude Groves of Appledore. Born in Appledore in 1925. Died 29 July 1943 aged 18. MV Cornish City, (a British cargo transport) was torpedoed by German submarine U177. 37 were lost out of a crew of 43. 126016 Flight Lieutenant (Frank) Peter Burbridge of 97 Squadron, the RAF VR. Son of Percy and Dorothy Burbridge; husband of Ethel Vera Burbridge of Lichfield, Staffs. Born in Appledore in the June Quarter of 1921. Died 22/23 November 1943 aged 22. His wife was 3 months pregnant with twins at the time of his death. 1649542 Corporal (Edmund John) "Jack" Evans of the Base Signals and Radar Unit, the RAF VR. Son of John and Elsie Evans of Appledore. Born in Appledore in the December Quarter of 1920. Died 7 November 1944 aged 24. Killed on a Landing Ship Tank en route to Ostend, which hit a mine. 14 officers and 224 Other Ranks were killed in the same incident. Not yet confirmed. RAF Crews were particularly keen on nicknames at the time and "Hamish" was a popular one. 1315832 Sergeant (Wireless operator/Air Gunner) Samuel L. Squire. Son of Samuel and Elsie Squire; husband of Annie Louisa Squire of Appledore. Born in Exeter in the June Quarter of 1921. Died 15 June 1944 aged 23.